Installation view of Hyogo Prefectural Museum of Art. 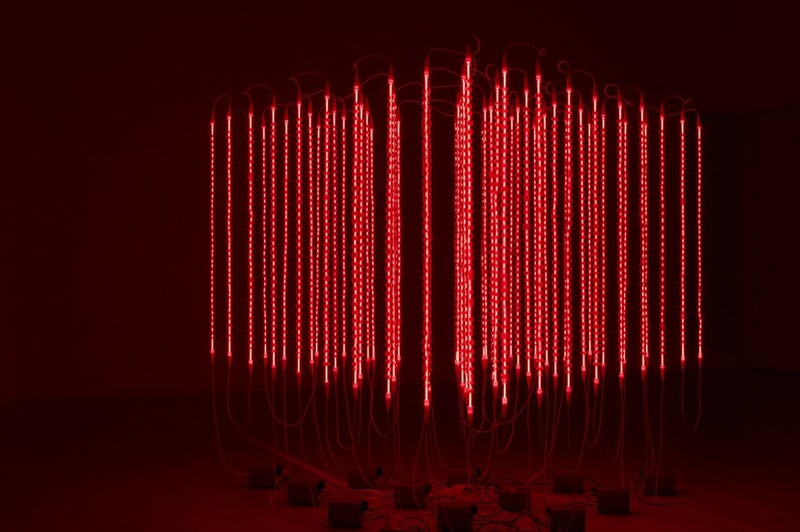 Neon tubes with a free flowing form give off a soft light. Installed at about eye level, they do not immediately allow us to perceive anything other than their form. Initially, the entire aspect of Untitled (Stele I), displayed alongside Alberto Giacometti’s Stele I, does not reveal itself to us. 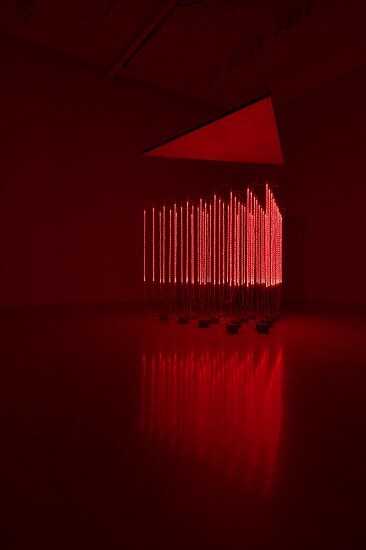 But when we crouch down and look up at the neon tubes, placed on a piece of glass, we realize that it actually consists of a garbled version of the basic information related to Giacometti’s sculpture – i.e., the artist’s name, the work’s title, the year it was made, the materials used to make it, and its size. In other words, though their forms differ, the two works show the same information. As this suggests, Kunitani’s work is equipped with a mechanism, which, though invisible, catches our attention as we move around it. Kunitani’s motifs are familiar things like mirrors, hourglasses, balloons, neon, and incense sticks, but these things deserve closer consideration. Mirrors reflect images, balloons swell, incense burns to ashes. Tracing these specific operations back to their sources, we notice that light and air are elements that rise. Light is also indispensable in plant photosynthesis, the production of vitamin D in the human body, and the dramatic expansion of a wide range of our activities. And air is the source of biological activity. Through a gaseous exchange between oxygen and carbon dioxide, breathing gives us energy. Because these phenomena, which constantly cause change and repeatedly generate various things, are so natural, they easily bypass our awareness. But Kunitani carefully picks them out and presents them as art. This explains why his works, using products such as mirrors and balloons that are systemically made by machines, are tinged with a warmth that is reminiscent of a living thing. They do not merely have the shape of an object; they also exert an influence on the information they contain. This is similar to Joseph Kosuth’s works that consist of a chair, a photograph of a chair, and an enlarged reproduction of a dictionary entry for the word “chair,” except that Kunitani’s works have more visual appeal. The simple process accentuates the essential poetic qualities of the object, leading to an indescribable viewing experience. The mechanism in Kunitani’s works also invites us to actively relate to the pieces, and instead of merely looking at them, allows us to make physical contact with the entire thing by entering a space. Our participation is akin to the last piece of a puzzle that completes the work. Handout is an excellent example. The work begins with the artist ripping out pages of a book that he has read and passing them out to people along a busy road. Through Kunitani’s distribution process, the dismantled book (narrative) expands in the direction each of the people who receive the pages moves. This literally has the effect of spreading the book around. One person might try to imagine what happens after the fragment of text they have received. Another person might fold the page into a paper airplane and throw it. The moment the pages leave Kunitani’s hands, the future of the narrative vanishes into a whirlwind of possibilities. After he finishes distributing the pages, Kunitani projects a documentary video of the event on the inside of the book’s cover. Through this process of diffusion and convergence, the story that Kunitani read changes form and returns to the place where it started. A strong awareness of this concept of place is also present in one of the artist’s most important series, Spaceless Spaces. In an exhibition at Art Tower Mito in 2003, Kunitani suspended blue neon tubes in a circular shape in the center of a relatively small gallery. And by leaving part of the structure open, he invited viewers to enter the circle. They could take a close look at the work, and the light that filled the room even created a sense of oppression. But when viewers entered the circle, their perspective was reversed and they were able to follow the light to its destination. This engendered a change in the relationship between the light and the viewers. Kunitani’s way of positioning the neon lights to correspond exactly with the place is reminiscent of Donald Judd’s metal rectangles. But the intellectual, rational, and therefore, cold quality of Judd’s work is absent from Kunitani’s. 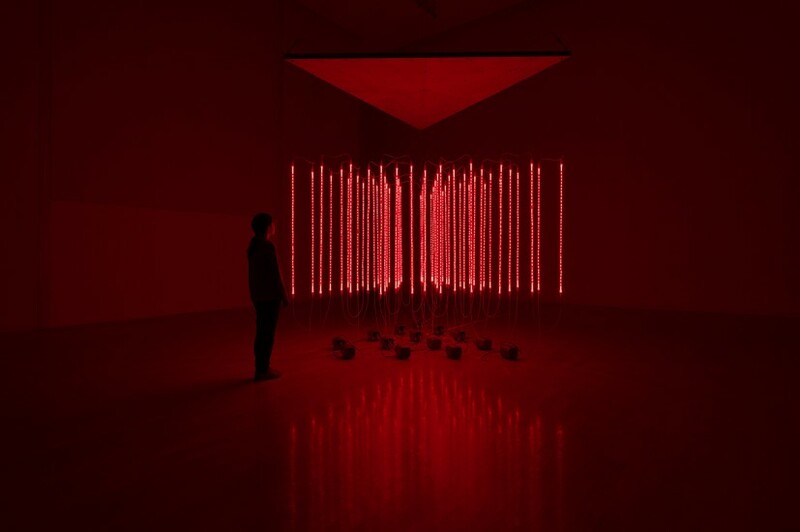 This is due to the fact that Kunitani finishes his works by creating a series of orbs in the neon tubes by blowing air into them. This reflects the light flowing through the tubes in the distorted glass and makes it appear to waver subtly. Studio 1, the display venue for Spaceless Spaces (Deep Projection), has a rectangular form with a width and depth of approximately 13 meters and a height of 7.7 meters. Hanging in the center of the room is a 1.5-meter-high triangular framework, each side of which measures 3.2 meters in length, which is made up of 55 neon tubes. 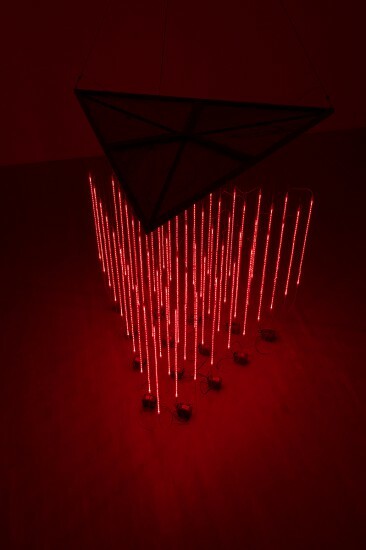 This technique – a new development in the series – of filling the center of the triangle with neon tubes, amplifies the intensity of the structure. As we walk around the column, we come face to face with each line, angle, and plane. While sensing the rectangular structure in the background, the large and countless layers in the volume of light directly appeal to our bodies. This is no less than an attempt to acquire the red color of light that we would normally overlook, and by extracting it, make it substantial. Next, try approaching the work from a different perspective. Imagine moving up past the second and third floors, hovering in the air above the museum, and looking down on the work in Studio 1 on the first floor. When we look down on the entire building, we see the red light of the triangular column shining in the northeast corner. It has the appearance of a massive wedge driven deep into the corner of the huge structure. read the explanation for "Spaceless Spaces (Deep Projection)"